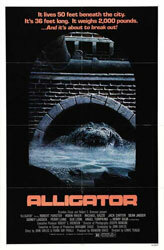 In 1968 a young girl buys a baby alligator from a roadside attraction. The next day, her father waits until she leaves for school and flushes it down the toilet. A local medical research company has been dumping dead dogs pumped full of synthetic growth hormones in the sewer for years, which the alligator has been snacking on. When body parts start getting fished out of the sewer with alarming regularity, a disgraced cop (Robert Foster) and a young herpetologist (Robin Riker) find themselves facing an enormous monster. This movie played several times on ABC when I was young, I'm surprised at how much of it I accurately remembered. For what could have been a pretty standard giant animal movie, ‘Alligator’ is fast paced, witty and exceptionally fun to watch. The miniatures and mechanical alligator effects still hold up very well. A large portion of the film is shot in the sewers and it’s made into a very eerie and effective environment. Henry Silva has a brief appearance as a big game hunter called in to track and kill the alligator. It is nice to see a b-movie like this elevated to a higher level by a cast and crew that bring a lot of care and love to what goes up on the screen.